We’ve enjoyed an abundance of great shirts already, and the competition level has been incredibly fierce. One of my personal top 10 has already been revealed (Cruzeiro home), but there’s plenty more to look forward to. Thanks to all those who have stuck with us so far. The feedback continues to make me smile, and it means a lot to see people enjoying the list and the shirts that make it up. Have any thoughts on what could be better? Did your favourite make the list? Tell me on Twitter! Whodda thunk that the Italian top division would give us at least two football-style “brands” which are so unique and beautiful? Them Italians, eh? So Samp’s home shirt is unbeatable due to the design? I raise you Fiorentina home. How do you manage iconic with just one colour? The answer is La Viola’s home shirt 2018.It is simply perfect. And I am traditionalist. So I like my Fiorentina kits with a 7up logo and a Batigol model. But this is simply sublime. No words required. Okay five: colour and cut equals perfecto. Simple, quintessential and elegant. 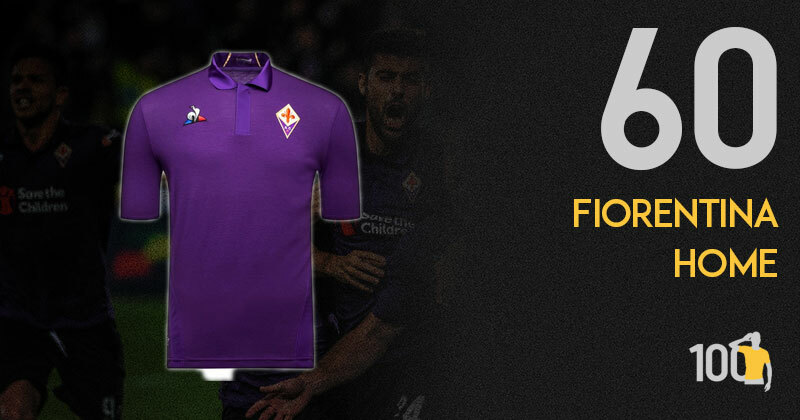 Fiorentina are one of those clubs that consistently have lovely home shirts, and this is no different. The alluring shade of violet is always a welcome sight, and the polo shirt styled collar design makes the shirt look even more classy. Le Coq Sportif haven’t strayed too far from what’s expected, and that’s a good thing. There should be more cheques in football. We cannot rely on Croatia to do it all for us. This is brilliant. A well used adidas template tweaked to perfection to produce an excellent away kit. 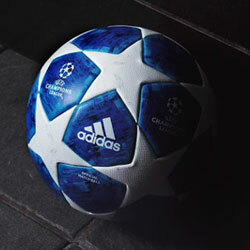 The horizontal lines of varying width which have been used liberally by adidas this year are employed brilliantly by the chequered pattern and the black and blue colour scheme. A simple use of white for badge, sponsor and trim cap an understated but lovely shirt. 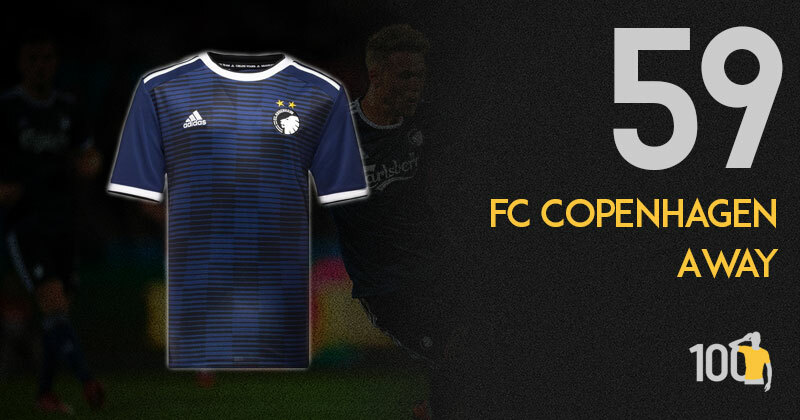 FC Copenhagen have a wonderful away shirt. The black and blue pattern looks great, and Adidas have a really wonderful template to exploit here, as I’d love to see it in other colour schemes too. The white secondary colour works great and compliments the black/blue perfectly. The clean navy sleeves are slick too, keeping the shirt looking tidy. Yes, yes, yes. Macron are ripping up trees this year. This is strong. I have always been a fan of red and green, it takes me to early 90s umbro Wales and it just works so well. Macron have used the combo to brilliant effect on this shirt, with a pure white shirt trimmed with the two colours on collar and cuffs. The Christmas-jumper-esque detail on the lower ribs is a welcome flourish, and that soviet-era badge is simply to die for. Like it all. Alot. 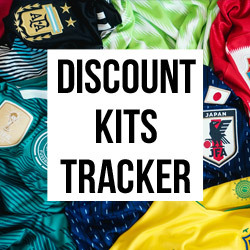 UEFA’s ‘kit assistance’ scheme was launched in 2007 to help offset the costs of smaller associations that have limited resources. 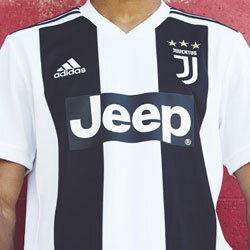 In 2017 they subsequently confirmed a unique partnership had been formed with Macron and this shirt is an example of the scheme’s brilliant success. 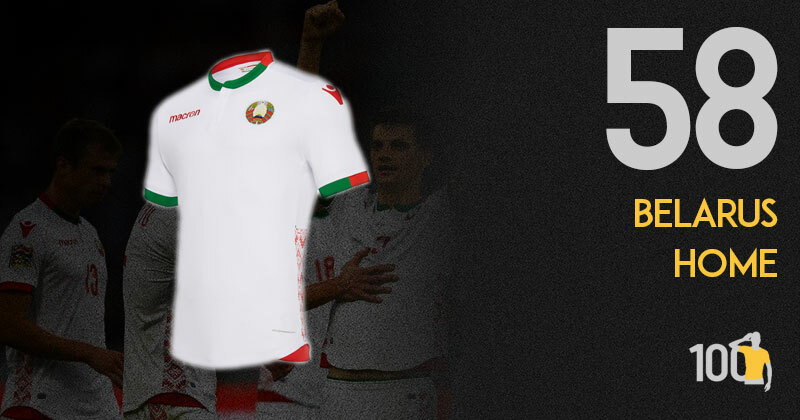 A classy all-white piece with trimmings of red and green (the colours of the country’s flag), as well as a beautiful traditional Belarusian pattern which lines either hip, is a welcome stray from the boring Adidas template shirts they have been plagued with in recent years. A lovely, soviet-like crest is the icing on the cake for this wonderful shirt. I’ll be honest, I was surprised to see this kit so high on the list. But then I looked back at pictures of Iceland’s game against Argentina, and I remembered how good everyone’s second favourite team looked when they played out a gutsy 1-1 draw against Argentina. This version of the design brings out the sleeve pattern perfectly, with the white of the chest fading smoothly into the shoulders. 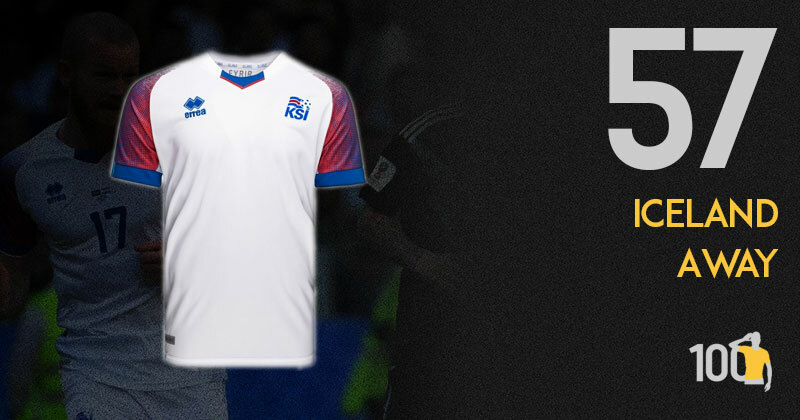 Erreà deserve a tonne of credit for producing two wonderful kits in back to back major tournaments for Iceland, and they should be getting more shirt gigs as a result. I said it all with the home kit. So just cut and paste here. I do love a matching home and away kit template. And I love it even more with a reversed colour scheme. This is how kits used to be designed and is wonderfully comforting. This away kit is even better when viewed in combo with the home and third kits. A great trilogy. Tibet may have finished bottom of their group at this year’s ConIFA World Cup but they got knocked out looking like a million dollars. This shirt, designed by COPA, is easily one of 2018’s best. Taking inspiration from the team’s crest, the shirt certainly has one of football’s most unique patterns. What makes it truly special is that COPA have used the placement of the badge and the blue and red stripes to make it look like it is a sun shining bright. A beautifully original and creative shirt. Tibet’s story is an interesting one in terms of both football and politics. The team as it is today was formed by the Tibetan exiles in India in 2001 and was followed by a documentary crew as it attempted to get frankly terrible amateur footballers ready for a proper international fixture - a 4-1 defeat to Greenland which eventually took place in June 2001. Now onto the kit. 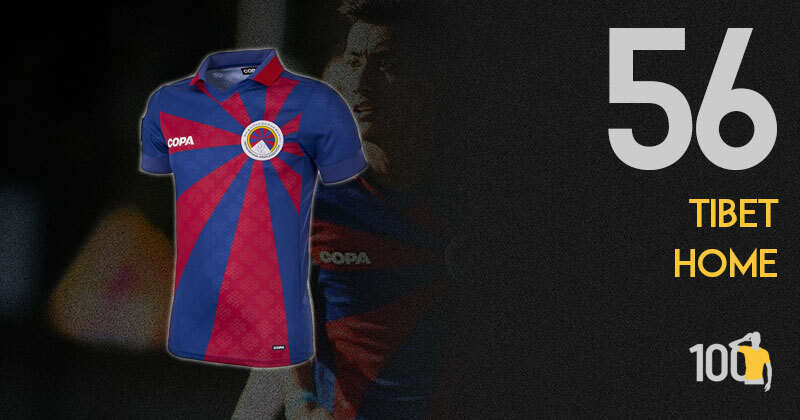 A reflection of the blue and red rising sun depicted on the banned Tibetan flag, the shirt is produced by European retro kit manufacturers COPA. The rays shine out from the team’s crest which is therefore depicted as the sun itself. Black and gold is a winning combination, and this Hellas Verona shirt is no different. The shirt also features an alternate badge, using the ladder of the Scala family as its main feature. The collar features a strange design, definitely unique, and whilst it’s not for me I can see the appeal there. Overall Macron have done a lovely job and used black and gold to a good effect. As a traditionalist (that’s a posh way to say I am old and dull) this isn’t even the best of the three kits the club have this year. I very much prefer the home and away, particularly when they’re considered together. That said, if you’re gonna release a third kit make it different. And they have done well here so understand the placing. The kit is simple and classy. The stripped back badge on the club’s age imprinted behind it work well. I am still a sucker for a good black kit, and this is a good black kit. Another kit that grows stronger when you view it alongside it’s away kit sibling. If I had my way away kits would be the EXACT same template with reversed colour scheme of their home shirts (you getting bored with this theme yet?). Until I take over the world and make this my first decree I can rest easy with LAFC’s shirts this year. A simple template in black trimmed with gold: there’s absolutely nothing to dislike here. Other than the sponsor. Which I hated at first. But what’s more LA than Youtube? Makes me giggle in a smug, hipster-post-modern-ironic-kinda-way. Probs over thinking it but adds to the shirt very well. This shirt is a few small tweaks being an all-time great. The colour scheme is timeless, and as you've probably noticed there’s a lot of black shirts on this list which is no coincidence. Then we have the pattern, which evokes the legendary Holland ‘88 template. I’d love to see how this would look with more a gradient look like that Dutch shirt, but that’s being picky. 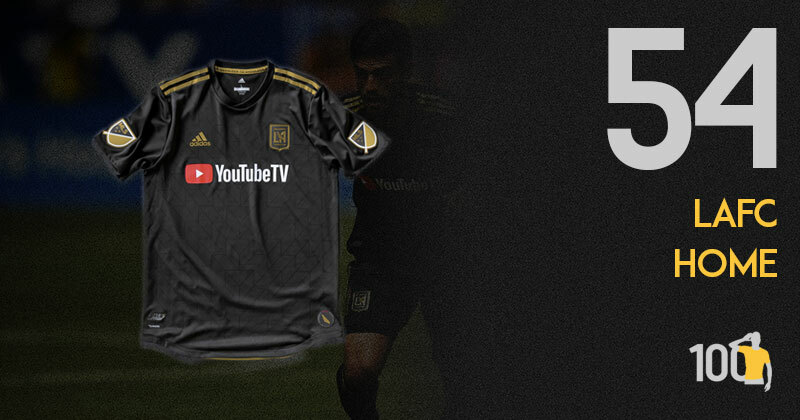 A lot of people highlighted how the sponsor stands out too much in red, and I’d agree that a better sponsor would’ve helped, but as a whole LAFC couldn’t have wished for a better looking inaugural home kit. Not sold on this kit at all. Looks like the really foreign jar of pickle in the supermarket down the road that your aunty loves. 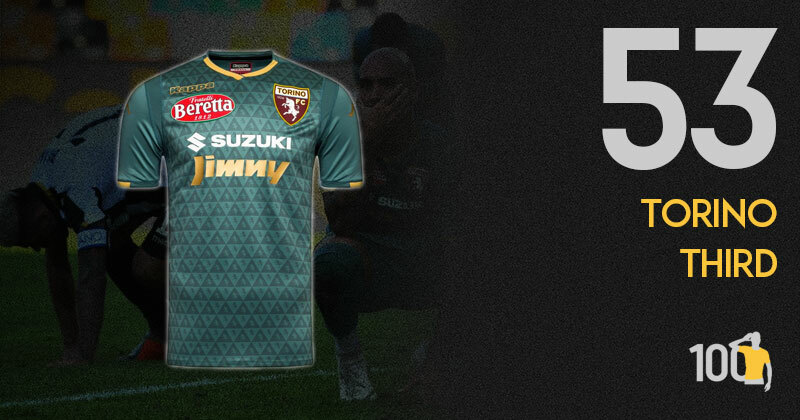 Sponsors don’t really work that well together and the colours hardly represent Torino. Understand it’s a third kit, but still rubbish. 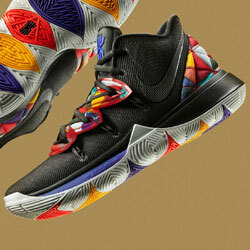 Outside of that, I do like the triangle and horse concept, just had potential to be better. Torino have really spoilt us this season. What a sweet third kit. Again featuring the same triangle bull pattern as seen on the home shirt, the forest green colour used looks wonderful, and the darker greens seen in the pattern really seduce you. The amber collar and sleeves look good too, however the second sponsor below the Suzuki really clutters up an otherwise beautiful shirt. Big stuff coming out of Paris for this one. 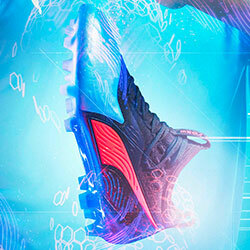 A collab between themselves and Jordan is hopefully the start of something bigger! PSG have done a few collabs this year and it’s exciting to see. Although not an overly exciting kit, its significance lies in pushing the envelope and inspiring other big clubs to collab with local talent. Can’t wait to see what happens in 2019! Whilst PSG have been heavily criticised for their capitalist approach to football, and their subsequent partnerships with BAPE and Air Jordan, as a boy with an unhealthy trainer obsession I was wonderfully excited to witness the Jumpman logo on a football shirt for the very first time. A completely blacked out piece featuring a sole grey stripe down the centre and a grey version of the PSG crest, along with the sponsor and famous Jordan logo, this is a shirt I already know will be seen at festivals a plenty in summer 2019. This shirt is just beautiful, isn’t it? You just know that if you have Hummel as a kit supplier, your club is going to look amazing wherever they play. Everything about this shirt is just right. A beautiful two-coloured sash is the highlight of the shirt, but what makes it really stand out, is the fact that the shirt is uncluttered. This allows the sash to really dominate. And of course no Hummel shirt would be complete without the classic chevrons on the sleeve. This shirt makes me one happy Hummel fanboy. 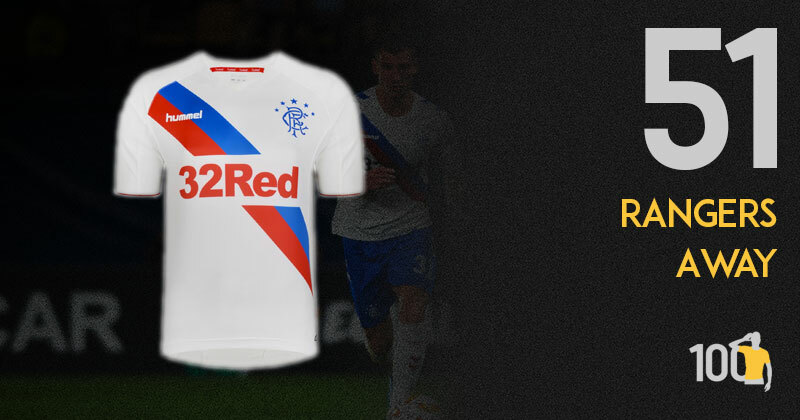 I can’t deny that I adore a shirt with a two-colour diagonal sash - Manchester City’s third kit from 2010 is my favourite shirt of all time - so Rangers away kit ticks all the right boxes for me. Hummel’s iconic chevrons look beautiful regardless of what they’re slapped on and remind me heavily of my former years in grassroots football; in blue on a white background here they look incredible. I have been pleasantly surprised by some kits in Scottish football this season and this is undoubtedly the best of them all. 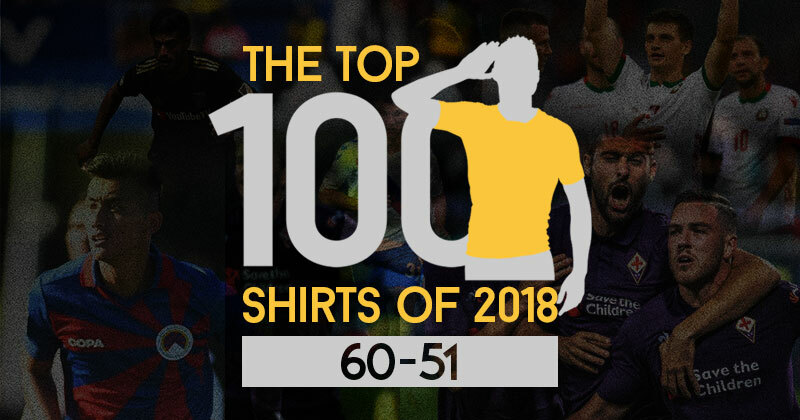 The next time you read a Top 100 Shirts article, we'll be in the second half. I can't wait.